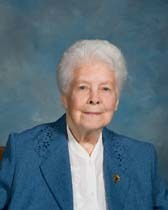 Sister Eleanor Pierre Catterall died suddenly September 22, 2018 at Saint Joseph Villa where she had resided for fourteen years. Her Mass of Christian Burial was celebrated September 26, 2018 in the Villa Chapel where relatives, friends and her sisters in community rejoiced in 101 years of life, 83 of which were dedicated to the Spouse of her heart as a Sister of Saint Joseph. Born August 25, 1917, Eleanor Mary was the eldest of seven children born to Francis and Mary in Kearny, New Jersey. Some years later the family moved to North Arlington where Mr. Catterall, his brother and a family friend were instrumental in establishing Queen of Peace School and requesting the Sisters of Saint Joseph to staff it. In 1935 Eleanor became the first graduate of Queen of Peace High School. In the same year she entered the Congregation and three years thereafter, her sister Margie, our own Sister Francis Thomas and a cousin, Sister Thomas Therese joined Eleanor in response to God’s invitation. While both Catterall women predeceased her, the three were blessed in their seasoned years to share the happiness of residing together at Saint Joseph Villa. Sister Eleanor Pierre Catterall, a musician from her earliest years, praised God with the music of her heart and uplifted all whom she encountered with God’s love, peace and joy. Having earned a Bachelor’s Degree in Music from Chestnut Hill College and a Master’s Degree in Music from Catholic University, Sister taught music at the elementary school level and at West Catholic High School where her musical expertise was recognized by the Philadelphia Orchestra. Her students delighted in her presentations and many bonded with her in lifelong relationships. Beyond West Catholic, Sister served dutifully and happily as local coordinator, elementary school teacher and principal, and local superior at Saint Joseph Villa. For fourteen years her ministry as school receptionist endeared her to the people of Saint John the Evangelist School in Severna Park, Maryland. At Saint Joseph Villa Sister engaged in many activities. She was an avid reader and reliable choir member, enjoyed special prayer services as well as socials, especially an occasional wine and cheese party. Perhaps her most shining accomplishment was the discovery of her artistic talent. Her lovely contributions were proudly displayed at the Villa. Her aides will long remember that Sister blessed them with holy water as they finished their end-of-day attentions to her. Sister Eleanor nurtured an enduring gratitude for her vocation to the Sisters of Saint Joseph. For her, there were “no sad years.” Family relationships delighted her. Especially cherished was the tender attentiveness of her niece, Nancy, who for many years visited her every day. Those who shared communal life with Sister recognized her innate ability to uplift hearts by sharing God’s gentle joy and loving concern for all. She revered Abraham Lincoln who said, “And in the end, it’s not the years of your life that count. It’s the life in your years.” It was God’s life in the many years in the life of our dear Sister Eleanor Pierre that touched deeply and sustained kindly all whom she met. Her long journey ended, she is embraced for all eternity in the arms of the God of her heart.